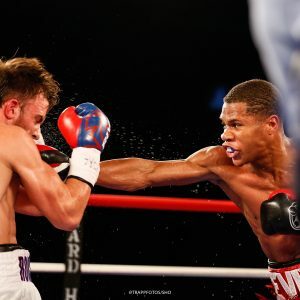 Hard Hitting Promotions, Greg Cohen Promotions and Devin Haney Promotions over Sho-Box before a standing room only crowd at the 2300 Arena in Philly Friday night. In the Main Event Super Lightweight Devin “The Dream” Haney, 19-0 (12), of Las Vegas, NV, forced Mason “Rock Hard Mighty” Menard, 33-3 (24), of Rayne, LA, to retire after nine shut out rounds to win the vacant USBA Lightweight title. This one was a mismatch from the opening bell with Haney dazzling Menard who couldn’t land but a handful of punches the entire fight. Haney had a machine gun like jab throughout. He would land the right hand almost at will though Menard had his hands held high at all times. Round after round Haney dominated. He made this vacant USBA title bout look so easy. He forced Menard to not come out for the tenth and final round. Haney will deservingly be in the top ten of the IBF rankings with this shout out of a match. Super Bantamweight Glenn Dezurn, 9-2-1 (6), of Baltimore, MD, was stopped at 1:47 of the 8th round losing to Joshua “Don’t Blink” Greer, Jr., 17-1-1 (9), of Chicago, IL. From the opening round up until the sixth round Greer dominated. Dezurn started to turn things around in the sixth and seventh rounds. In the eighth round Greer landed a hard right to the chin of Dezurn and down he went. He was up at the count of 8 from Referee Benjy Esteves, Jr. Greer raced across the ring having Dezurn defenseless forcing Referee Esteves, to wave it off! Light Heavyweight Alvin “Iron Majik” Vermall, Jr., 15-1-1 (12), of Catskill, NY, was defeated by southpaw Charles ”The Truth” Foster, 16-0 (8), of New Haven, CT, over 8 rounds. In the first round the taller Foster used his jab with Vermall trying to get inside. Foster keeps measuring Vermall who is missing more than landing. Foster landed a lead left to the mid-section of Vermall. Foster ended the round with a hard left uppercut to the chin of Vermall. In the second round Vermall rocked Foster with a right uppercut. He keeps leaping in trying to land the big punch on Foster who is not co-operating. Referee Rosato warns Foster for hitting behind the head. Foster landed a 3-punch combination. Vermall came right back just before the bell landing a solid right to the chin of Foster. In the third round Foster keeps pawing with the jab with Vermall rushing in and ending in a clinch. Foster uses an occasional left uppercut to the chin of Vermall who seems frustrated not getting his punches in. In the fourth round Vermall leaped in with a left hook to the head of Foster. Foster lands a lead left to the chin with Vermall coming right back with a right to the chin of Foster. Too many clinches on the part of both. Vermall ends the round with a solid right to the chin of Foster. In the fifth round Vermall comes out trying to make a brawl of it while Foster lands a chopping left to the head of Vermall who comes in low. Foster lands a solid left uppercut to the chin of Vermall. Vermall hurt Foster with a wild right to the chin at the bell. Super Bantamweight Arnold “Arni” Khegai, 12-0-1 (5), of Odessa, UKR, defeated Adam “Mantequilla” Lopez, 16-3-2 (8), of San Antonio, TX, over 8 rounds. In the first round Khegai is pushing Lopez back with little action in the round. In the second round Khegai landed a lead right to the chin of Lopez. Khegai landed a right hand to the chin of Lopez driving him back halfway across the ring. In the third round Lopez landed a 3-punch combination rocking Khegai. Khegai landed a lead right to the chin of Lopez just prior to the bell. In the fourth round Khegai landed a lead right to the chin of Lopez who came right back with a left hook to the head of Khegai. Halfway through the round things started to heat up a bit. In the fifth round Khegai landed a chopping right while in a clinch and then was warned for using the cuff of his glove. Both fighters have received numerous warnings. In the sixth round Referee Benjy Esteves, Jr. took a point from Khegai. Both boxers are throwing wild punches with neither gaining an edge. In the seventh round both boxers are throwing bombs and then falling into a clinch. It’s been a very sloppy showing up to the eighth and final round. In the eighth round Khegai rocked Lopez with a right hand to the chin. Lopez came back with a combination to the head of Khegai. Khegai landed a left hook to the chin of Lopez heard throughout the arena. Judge Braswell and DiPalo had it 78-74 and Carter 78-73. This writer had it 77-74. Lightweight southpaw Jeremy “King” Cuevas, 9-0 (7), of Philadelphia, stopped Hector Marengo, 7-12-4 (4), of Arecibo, PR, at 1:51 of the second round. In the first round Cuevas landed a lead left to the chin of Marengo knocking him back several steps. Cuevas landed a lead left to the head of Marengo stunning him. It was all Cuevas with little action. In the second round Cuevas landed a flurry of punches pinning Marengo in a corner. Cuevas landed a dozen punches finally dropping Marengo to a knee. Cuevas jumped on him causing referee Shawn Clarke to wave it off. Lightweight Branden “The Gift” Pizarro, 10-1 (4), of North Philly Badlands, shut out Israel “Isra” Villela, 6-10 (2) of Cancun, MEX, over 6 rounds. In the first two rounds Pizarro dominated with his jab while Villela got in a right to the body and a left hook to the head. Pizarro briefly turned southpaw. In the third round Pizarro continued to move well using his jab with an occasional right to the head of Villela. Pizarro got warned by Referee Bashir for pulling Villela by the back of the neck. In the fourth round the flashy Pizarro landed a right uppercut to the body of Villela. Villela was chasing Pizarro until he ran into a flurry of punches. Villela landed a right to the head of Pizarro who shook his head as if there was little on it. Pizarro landed a right to the head followed by a left hook to the body. Pizarro landed a hard right uppercut to the chin of Villela that got the fans into it. In the fifth round Villela landed an overhand right to the chin of Pizarro. Pizarro switches from orthodox to southpaw with little coming from southpaw. The fans start chanting “Branden, Branden”, just prior to the bell. In the sixth and final round Villela walked into a Pizarro left hook to the chin. Both boxers warned for infractions by the referee. Pizarro ended the round with a left hook to the chin of Villela. Judge Carter, Weisfeld and DiPallo had it 60-54 as did this writer. Light Heavyweight David “One-Two” Murray, 7-2-1 (6), of Wilmington, DE, was knocked out by Jamaican Craig “Danger” Duncan, 11-1-1 (9), of Apopka, FL, at 2:45 of the fourth round. In the first round both fighters are known for their punching power which means there is little action with one waiting for the other to land a bomb. The last thrown punch of the round was Duncan landing the first right hand to the chin of Murray. In the second round Duncan continues to stalk Murray finally both are opening up. Duncan carries his hands to his side finally landing an uppercut to the body of Murray. Duncan pinned Murray against the ropes. Murray landed a right to the head of Duncan. In the third round Duncan comes out using a lot of feints and landed a right to the head of Murray. Murray landed a right of his own to the head of Duncan seconds later. Duncan forced Murray to hold after landing a pair of body shots. With half a minute left in the round Duncan landed a flurry of punches. In the fourth round Murray landed a double left hook to the head of Duncan. Duncan came back pinning Murray against the ropes with both fighters landing haymakers. Duncan landed an uppercut to the chin of Murray and down he went to a knee. Duncan landed a lead right to the chin of Murray who went face first down and out cold. It took about 10 minutes before Murray was assisted from the ring. In the opening bout returning after 18 months Super Lightweight, Milton ”El Santo” Santiago, 17-0 (3), of North Philadelphia, shut out Jorge L Munguia, 13-12 (5), of Tegucigalpha, Honduras, over 6 rounds. In the first round both fighters were mixing it up. Santiago landed a combination dropping Munguia. Santiago ran across the ring jumping right on Munguia knocking his mouthpiece out. Santiago was warned twice about hitting behind the head by Referee Ron Bashir. In the second round Santiago continue to press Munguia who wouldn’t give up. Santiago landed a lead right to the head of Munguia. Munguia started pressing Santiago until he ran into a combination from Santiago. In the third round Santiago was warned for a third time by Referee Bashir this time for using his head. Munguia was warned for a low blow. Santiago controlled the round but the action slowed down. In the fourth round Santiago backed Munguia into a corner but Munguia fought himself out of the corner. Santiago is going to the body with uppercuts from both hands. Munguia is very game. In the fifth round Santiago is still throwing punches but Munguia shows him no respect fighting back. Santiago is warned for pushing. Munguia is throwing punches but can’t match Santiago. In the sixth and last round missed with a pair of uppercuts. Both boxers raised their arms up trying to get the fans into it. Santiago has a pleasing style but little power or Munguia would have been out by now. Munguia was warned for a low blow. Judges Page had it 60-54 Judge Carter, Weisfeld and this writer had it 60-53.